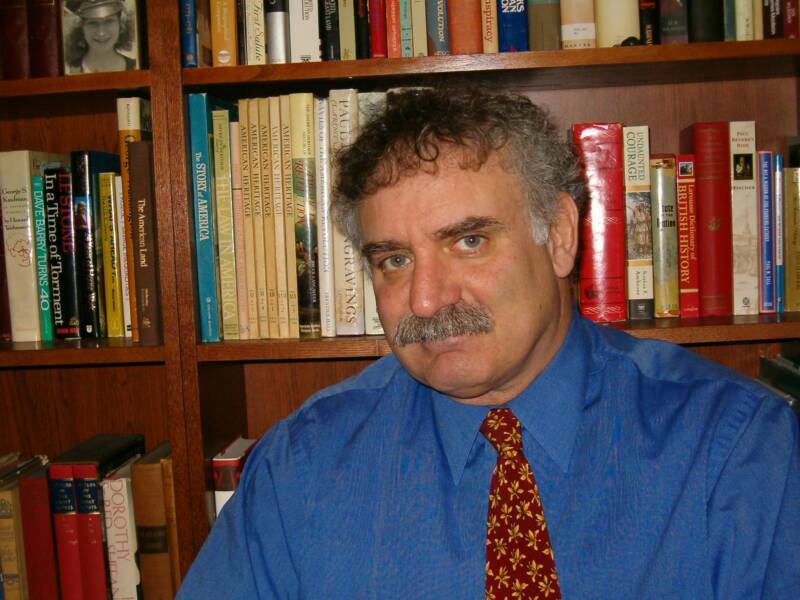 My friend Bob Sacks, the publisher of America’s oldest e-newsletter (since 1993), has taken the Magazine Publishers of America (MPA) to task regarding the recent layoffs at the MPA and the compensations the MPA’s leadership are paid. Bob and I agree to disagree on a lot of things, but as for the article that follows, Bob and I are in total agreement. I would love to hear your opinion on the matter and your opinion on the role of the MPA and its American Magazine Conference that takes place next week in California. I hate to think that my friend Bob is the only sane voice left in our industry. Last week I sent out what I thought was a calm and sensible article about the management salaries of publishing associations titled BoSacks Asks: What’s a Pound of Flesh Worth These Days, Anyway? I was attempting to provide our industry a thoughtful dialog in these stressful and unprecedented economic times. There was nothing intentionally personal, nothing specifically actionable for or against a single person or association. I just wanted to present some overall logical questions and start a reasonable and thoughtful review of financial executive deployment of executive salaries in associations for the publishing business. Somehow it seems especially relevant with the ascendency of digital publishing in the 21st century. Today, I feel I must alter that neutrality and zero in on a single association. The MPA, the Magazine Publishers Association has initiated an action that for me requires closer examination and strikes me on the surface as insensitive in its execution. Of course, I do not know all the details. So I only have conjecture to work with. Were these workers not doing their job well enough? If that’s the case then the layoffs should have been swiftly completed. If they had been doing their job well, then perhaps the association and the industry still needs them. Is the industry no longer in need of the MPA’s work as the largest publishing association? Are they lowering their goals and standards for the industry? I think we need competent magazine associations now more than ever, to do more than ever before. There is too much competition and too many advertising alternatives for us not to be at our peak performance. What happened? Lop off the heads of the worker bees that actually help make the honey flow and let the royalty continue on with their compensation to the possible destruction of the entire hive? Is there such a thing as a reasonable limit for executive pay? I suppose the best answer would have to be based on actual and identifiable results. What have been the actual results of the current administration of the MPA? Where are we as an industry and where do we need to be under the current conditions? Are we as an industry forward thinking enough and keeping up with the advent of multiple and ever changing competitive platforms? Has the MPA kept up with the needs of the industry? If it has, then the compensation may be warranted. If the MPA’s management indeed shared in the pain of these layoffs in some way, that is not apparent to this reporter. But if that is so, then I apologize for this errant conversation. Either way, as always, I leave my newsletter completely open for a public response from all. As some of you know, the other hat that I wear is that of the chair of the Department of Journalism at The University of Mississippi. Today Ole Miss is hosting the first presidential debate. Barack Obama and John McCain will be on campus engaged in the first of three presidential debates before the November elections. I am teaching an internship class preparing our students to work with the media during the debate week. 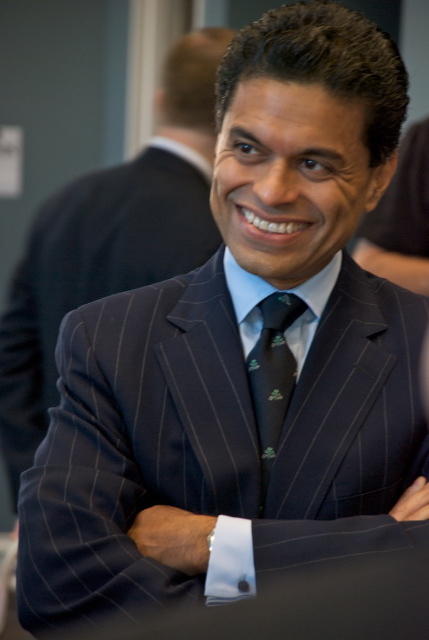 Those students had the opportunity to ask Fareed Zakaria, Newsweek International Editor, some questions regarding the presidential debate and the role of the media in covering the debate. The students submitted the questions to me, and I, in turn, sat down with Dr. Zakaria and asked him the students’ questions. Do you feel that the media has actually been biased in its coverage favoring one candidate over the other? I think there is no such as thing as the media anymore. I never quite understand what people mean with the disaggregated nature of the media right now. Has Fox News been biased in covering the candidates? I leave it to you to answer that question. I think if you take the media as a totality, no, I don’t think it has been biased, but any individual player in the media that you happen to have a particular gripe with, you will probably always find that true. I will say with some sincerity and honesty that the two organizations that I represent, CNN and Newsweek, I don’t think we are particularly bias. I think there are some ways in which coverage takes place which reflect certain institutional biases of neutral media when you spring a completely new candidate on the scene like Sarah Palin. There is going to be a feeding frenzy to try to figure out who she is. That would have happened whether she were left wing or right wing. Other than that, no, I think in general that CNN and Newsweek, at least, have been pretty balanced. Back when I was a student at The University of Missouri-Columbia in the early 80s, I had my first chance to meet the legendary magazine editor John Mack Carter. Mr. Carter has launched more new magazines than anyone I have met. So, needless to say meeting him was like meeting the candy man in the candy store. I was introduced to Mr. Carter and was amazed by the vast knowledge and wisdom he possessed when it came to magazine editing and new magazine launches. Later in life, I was fortunate enough to work with Mr. Carter and learn a lot from his style of publishing and editing. His prophetic words are as true today as they were in the early 80s. September is proving to be a great month for new magazine launches. From the mass 9 million giants like Spry, to the mass luxury 800,000 circulation WSJ., to the monster 360-page Michigan Avenue in addition to the tens of other titles that have appeared, so far, on the nation’s stands for the first time this month. September, so far, has been a breath of fresh air when it comes to new magazines. All of sudden we are witnessing the media (yes the media, and the print one in particular) increase their doses of publishing the prophecies of those “end of print” doomsayers and the future is for every thing pixels. Try telling that to the publishers of the aforementioned magazines or to those select few mentioned hereafter that have seen their birth in “the best month to launch a new magazine: September.” Magazines like Wing., BBC Knowledge, Flash & Flex, debbie bliss knitting magazine, Tinker Bell, LA, the Los Angeles Times Magazine, Distill, Manhattan, Arkansas Life, Home Theater Design, Yoga Mom, iPhone Life, Strategy, Signatune, Scientific American Earth3.0 and Fine Champagne. Yes, I know the newsstands are facing a lot of problems, and some say that one of those problems is the overcrowded magazine field and the host of new titles that keep arriving on the nation’s stands. To those I say, new magazines are the life line of our industry, they are the ones that add new and fresh blood to our body and keep us ticking. 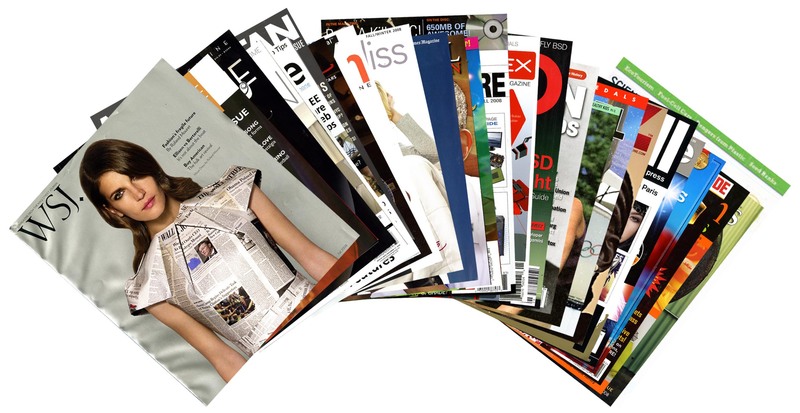 Without new magazines our industry will be as stagnant as it can be. We need the new magazines for two main reasons: one to keep our industry fresh and lively, and two to show those prophets of doom and gloom that the magazine industry is still, and will continue, to be well, alive and kicking… and not only in the special interest, limited circulation arena, but in all aspects of publishing form the mass to the class, there will continue to be new magazines published. Thank you John Mack Carter for your 80s advice, and thank you to all of the aforementioned magazine publishers who indeed are willing to take up yet another gamble on a new magazine. Sorry, my friend Bob Sacks, the new magazines, in all shapes and forms will continue to appear on our market place; and guess what, they will continue to be in ink on paper. Cheers. As some of you know, the other hat that I wear is that of the chair of the Department of Journalism at The University of Mississippi. This semester, Ole Miss is hosting the first presidential debate on Sept. 26. Barack Obama and John McCain will be on campus engaged in the first of three presidential debates before the November elections. I am teaching an internship class preparing our students to work with the media during the debate week. Those students had the opportunity to ask Richard Stengel, TIME managing editor some questions regarding the presidential debate and the role of the media in covering the debate. Our local newspaper The Oxford Eagle published the interview yesterday afternoon. Here is the intro and click here to read the entire interview. 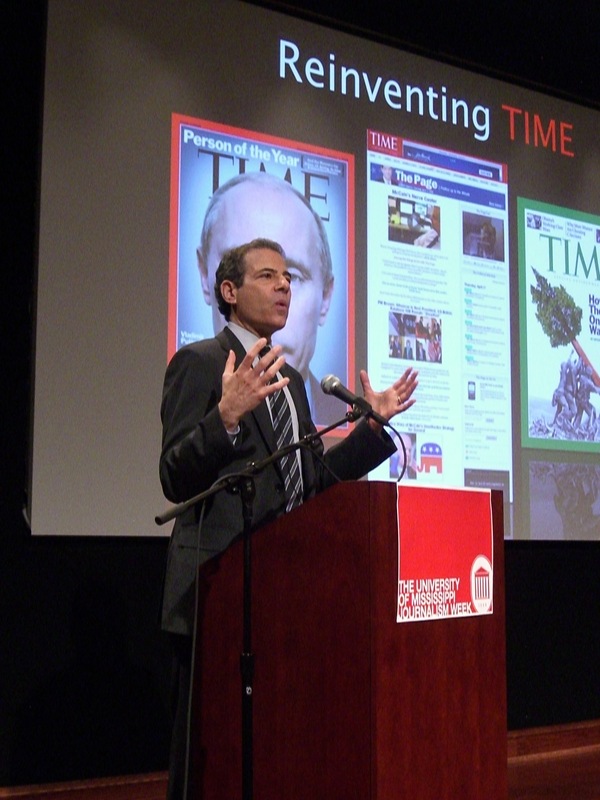 On Thursday Richard Stengel, TIME managing editor, was one of two moderators at the Forum on Service and Civic Engagement at Columbia University in New York that featured Barack Obama and John McCain. On Friday students from Ole Miss turned the tables on Stengel by asking him some questions about the media’s coverage of the presidential campaigns and his thoughts on next week’s debate at The University of Mississippi. The UM students are enrolled in the Journalism 495 Internship class that is preparing the students to work with the media expected to be in Oxford next week for the Sept. 26 debate. The students submitted the questions to their professor, Samir Husni, chairman of the journalism department, and he, in turn, asked Stegnel for his answers. This week a new feature debuts on the MrMagazine website. The Mr. Magazine™ interview. The inaugural interview is with Jason Binn, CEO and Founder of Niche Media. On Sept.15 his latest magazine launch, Michigan Avenue arrives at the stands and the doorsteps of the rich and famous of Chicago. The launch of MA is the most successful launch in Niche Media History. The magazine plans to publish two issues in 2008 and 10 in 2009. While others are folding magazines, Jason Binn is creating them. While others are trimming the sizes of their publications, he is introducing more oversized magazines. While other magazines are suffering from the economic crisis, his are flourishing. While others are happy with their launch issue being 100 pages, his latest premiere issue is 360 pages. While others are looking for a niche to cover, his magazines are very well grounded in a very lucrative niche: luxury. 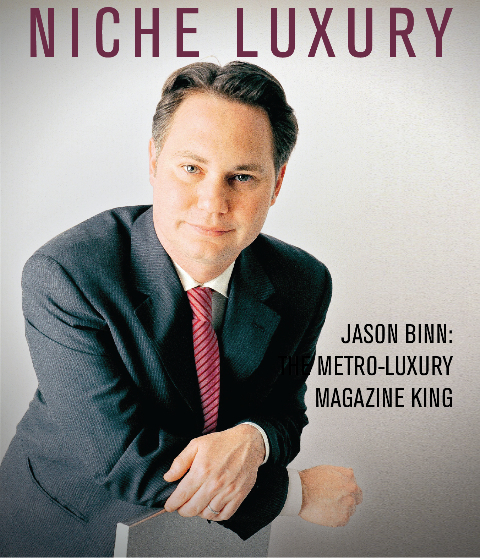 Call him the king of niche-luxury publishing, or even the Emperor of Metro Luxury Publishing; Jason Binn has been at it for more than 16 years. From the premiere issue of Ocean Drive to the premiere issue of Michigan Avenue, Binn is not leaving a single upscale town (or street) uncovered. As long as he can find people “who make money, have money and spend money,” Binn will create a magazine that is aimed to the needs, wants and desires of that specific audience in that specific city or street. Click here to read the entire interview. Niche Luxury Cover Photo illustration by Noah Bunn. 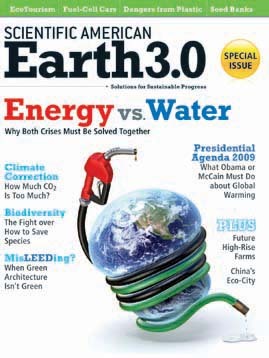 The greening of the magazine business have been witnessing a flood of new “green” magazines in the United States and abroad. Click here to read about the latest entries in the green magazine marketplace in the United States and click here to read about the latest entry in Europe. The sustainability of Earth1.0 + the prosperity of Earth2.0 for a new way forward. The 75th Anniversary issue of Esquire has arrived and 100,000 copies of the newsstand covers carry the world’s first E-ink cover. As you may recall last month Wallpaper magazine used, in their limited edition subscription cover, what they called Clever-Ink that only appears when it is placed under direct sunlight (See it here). Well, there has been a lot written about Esquire’s cover and the creativity of the E-Ink that makes the cover looks like a mini electronic billboard announcing “The 21st Century Begins Now (three hours later on the West Coast)”… and another mini electronic billboard inside the front cover introducing Ford’s Flex car. Is this issue a collector’s item? You bet, just look at all the listings on Ebay and the price that people are trying to sell this $5.99 issue for. I had my daughter take time off her job in New York City and head to Borders the minute the magazine was released on the newsstands to get me my copy and FedEx it to me in Mississippi. My first reaction was wow and so was the reaction of every one who saw the magazine in my office. Then I opened the cover and read Esquire editor David Granger’s letter from the editor. My wow doubled and my belief in the future of print doubled too. Indeed they are, and this world’s first E-Ink cover is nothing but an invite to dive into the pages of Esquire and enjoy the power of print and its content. A technological gimmick (two pages) that is very well done, but with content (320 pages of normal ink on paper) that is second to none. 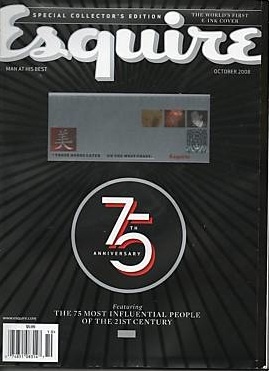 Congratulations David Granger and congratulations Esquire…Looking forward to the 100th anniversary edition and its great content, gimmick or no gimmick. You are currently browsing the Mr. Magazine blog archives for September, 2008.